Palm Sunday Morning- Find the kids worshiping Christ in this icon and hold your palms proudly like them for the procession. How do we greet a King? Who is our King? RECITE: "Hosanna in the Highest. Blessed is He that comes in the name of the Lord"
Palm Sunday Evening - ACTION:Kneel for the Procession of the icon of Christ as the Bridegroom when the priest brings Christ out from the Holy altar for the first time. Holy Monday- Light a candle in the dark serenity of this service. ACTION: Bow down to make 3 full prostrations in front of the Bridegroom icon of Christ. Holy Tuesday- RECITE: Memorize beforehand and listen for the verse "Behold, the Bridegroom cometh in the middle of the night, and blessed is that servant whom He shall find watching" PRACTICE: handwriting this phrase, or copying / tracing it as a memory verse. Holy Thursday- Take the chance to bow before, kneel and kiss our Lord on the Cross. TASTE: vinegar with your own kids as the soldier offered Christ on the Cross when He thirsted. Holy Friday Afternoon - Royal Hours - Witness or participate in the taking down of Christ from the Cross, identify in the icon who was involved (St Joseph of Arimathea & Nicodemus). 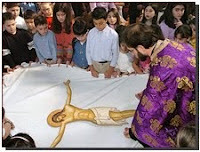 Observe a period of silence and identify Christ's white burial cloth. Compare it to the white cloth of His manger at Christmas. Holy Saturday Morning - Ring a small bell and throw the bay leaves, save one in your book! Chant the words of the 3 Youths (Shadrach, Meshach and Abendago). 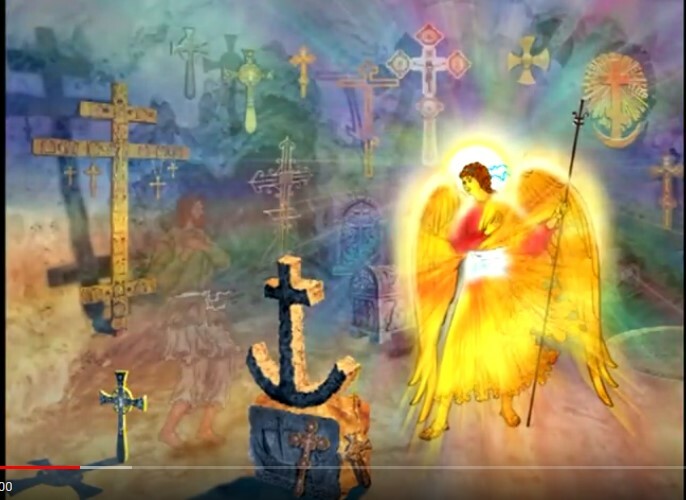 Hold hands dancing in a circle as your practice singing this again and again "Praise Ye the Lord and Exalt Him Forever"
Holy Saturday Evening - Experience a great celebration at Midnight - See the Church go dark, and witness the light of Christ illuminating all! Share your light with others - Plan to receive the Holy Eucharist of the Resurrected Christ after midnight, return home to crack your eggs and taste the traditional lamb soup mageritsa. Take the holy fire home to re-light your vigil lamps! Holy Sunday - Ask to read the Gospel in a different language, which is a tradition that conveys the "good news" spreading to the whole world. 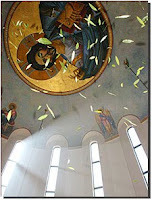 Bright Week - Practice saying "Christ is Risen" (click link) in as many languages as you can learn! If you parish plans other additional opportunities for the youth, please share! I have witnessed Holy Friday Retreats with activities and lessons, Holy Week Scrap booking , others ask the children and teens to decorate the Epitaphion (Tomb), in some parishes, girls of innocence and purity dressed in white sprinkle rose petals during the procession with the Tomb, others show a video from the Miracle of the Holy Fire in Jerusalem , and an all time favorite, one parish taught the children the hymn for Palm Sunday and the children lined up to create a passage way for the Entrance with the Gospel chanting and waving their palms! How precious it is to see them involved! Our kids may not be awake, but they can still go home smelling like incense, which in some small way, reminds us of the unseen blessings we all receive just by being in there. Thanks for sharing this. I know that Holy Week will be hard because my children go to bed very early, but it will be nice to teach them some of these things along the way. Thanks for all the wonderful ideas! I hope you are doing well!! Visit the new blog "Atheism, denial of truth"
nice post thanks fore sharing. children go to bed very early, but it will be nice to teach them some of these things along the way.